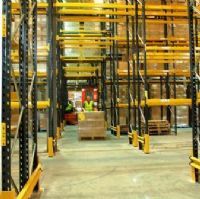 Link 51 pallet racking has four types of uprights that are combined with the bracing and base plates top form the pallet racking frames. The four pallet racking upright duties from Link 51 are M standing for medium, H standing for heavy duty E standing for extra heavy duty and S standing for super heavy duty. These all vary slightly in dimensions and design but do all take the same beams although technical and design criteria must be followed. M duty Link 51 pallet racking uprights are stamped on the front face with an M and are 83.44mm wide by 55mm deep into the pallet racking frame. H duty link 51 pallet racking uprights are stamped with an H on the front face and are 84mm wide and 65mm in the depth. E duty Link 51 pallet racking upright are stamped with an E on the frame and are 85.28mm wide and 61mm deep. S duty Link 51 pallet racking uprights are stamped with an S and they are 86.6mm wide and 61mm deep. These different duties can be combined to form frames using a splice for further technical details contact our pallet racking design team.